The strategy game of Reversi was invented around 1880 but gained much popularity in the 1970’s in it's modern incarnation. Reversi is also known as Othello, named after the famous Shakespearean play. It is a game similar to chess in it’s strategy where the player should always be looking ahead to try to predict their opponent’s moves. Reversi is played on a square board of eight by eight squares. Players use light and dark or black and white counters with the overall idea being to finish with the most counters showing your colours. The strategy lays in trying to surround the other player with your counters, thus changing them to your colour. Setting up the board is simply a case of placing two dark counters and two light counters in the middle four squares alternating so that no two colours are horizontally or vertically next to one another. Play begins and new counters are placed on the board, one at a time, with the dark counter player going first. New counters are placed on the board one at a time and may be added to squares adjacent to a counter of the opposing colour that is also in line (horizontally, diagonally or vertically) one space away from one of your own colour. This will in affect begin to surround in a line the opposing counter and once this is the case, the opposing counter is changed to your colour. A good strategy in Reversi is always to try and get to the corners on the board. Once in the corner, your piece cannot be flipped to the opposing colour. This makes the corner positions in the game extremely rich in strategic value. During the course of a Reversi game, counters will change colour again and again. This is due to the back and forth nature of the game play. The best Reversi players suggest a long-term strategy rather than a short-term gain. That is to say, you may well manage to change multiple pieces early on in the game, but this doesn’t necessarily mean you will win at the end of the game. 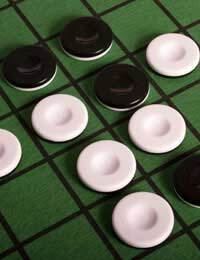 Scoring in Reversi is based on how many counters the players have on the board of their own colour. The person with the most counters of their colour on the board is the winner. Given a quick game of Reversi can take around 10 to 15 minutes, it is possible to make a best of scenario in which players play three or five games, calling the overall winner based on the amount of games won. Reversi has inspired numerous variations as it’s an extremely strategic game and thus works particularly well when programmed into a computer. Many good computer versions of Reversi will easily defeat human opponents and you can purchase Reversi to play against your computer, on your Xbox or even in hand held versions. Due to the popularity of Reversi, there is an annual world championship held each year where each participating country is allowed to enter three competitors. It is known as the world Othello championships and is often held in Japan. One of the most effective strategies whilst playing Reversi is to try to capture the corners early on. This is because once played, corners can't be flipped and so can be used to anchor other pieces that also can't be flipped. Another great strategy in Reversi is called mobility. This is where you reduce the number of legal moves your opponent can make, thus forcing them into making a move that is more beneficial to you than to them. As with any strategy game, you must plan ahead to succeed and always try and look at the end game to see how best to play throughout.